Treating your baby to a new blanket this winter? In this buyer’s guide, we’ll review the top 6 best horse blankets for sale in 2019. After that, we’ll outline some key things to consider when buying, helping you pick the perfect blanket for your horse’s needs. In this part, we’ll assess 6 of the best horse blankets based on warmth, breathability, durability, and value for money. Looking for a balanced blanket? At 200g of fill, the Snuggit offers a great deal of warmth, and excellent protection against snow, wind, and rain – the outer shell is completely waterproof. However, it’s also breathable, meaning your horse won’t overheat and begin sweating if they have a bit of a run-around with their pasture buddies. As well as a medium-warmth fill, you also get a 1200D poly outer with this blanket. This is basically some of the toughest stuff out there – it won’t get chewed up easily, and can withstand horses playing with each other. However, Tough 1 do state that it can get ripped by exposed nails for example or sharp edges on fences. This blanket is also pretty comfortable from the horse’s standpoint. It comes with shoulder gussets for maximum freedom of movement, and an adjustable neck to allow for the perfect fit. Even the most active of horses won’t mind wearing this blanket. Considering what you get, the price is pretty reasonable. The range of colors on offer is nice as well. Warm, but not too warm. Not especially resistant to thorns, nails, or other sharp objects. If you live in the mid-west or north east, keep your horses clipped, or have hard keepers, 200 grams might not be enough fill. This blanket from AJ Tack is just about as heavy-duty as they come, at 400 grams of polyfill. Obviously, it’s incredibly warm, which is particularly great for elderly/frail horses who currently live outdoors. As well as this fill, you also get a quilted inner lining for additional insulation. Like the Tough 1 Snuggit we just looked at, this option comes with 1200 denier ripstop fabric, which is super-durable. Not only is this blanket incredibly rip-resistant – the inner lining (including the fleece collar) holds up incredibly well over time, provided you take good care of the garment. It’ll even withstand your horse rolling in mud, scratching against walls, or playing with other horses, in large part due to how thick it is. Plenty of sizes and colors are available, and the price is quite reasonable considering what you get. Also, the waterproofing is well thought-through. The only downside to this blanket we can think of is it’s not incredibly versatile – you’d only really want to be using it at temperatures of 60° or lower, depending on your horse’s body type. It might be worth considering getting a thinner blanket to use as a substitute in slightly warmer weather, especially for easy keepers. Comfortable – comes with fleece material and quilted inner lining. May be too warm for some horses in temperatures above 60 degrees. Another quilted option is the West Style blanket from Derby Originals. However, unlike the AJ Tack option we just looked at, this is a stable blanket, meaning it’s only suitable for indoor use. Essentially, what this blanket provides is the best-possible comfort, while still keeping your horse warm. As a stable blanket, it’s not waterproof, but the inner quilting is nice and soft. Despite the relatively flexible design, the nylon is pretty tough, but can rip if snagged on exposed nails or other sharp protrusions in your stable. This is also a pretty warm blanket. You get 300g of fill and a fleece wither protector, so it’s perfect for hard keepers. It won’t have the same windbreaking capabilities as a good turnout blanket though. Just note that the buckles and straps can be a little confusing to get the hang of – no instructions are included. The price is great though, and once you get used to it, the design isn’t a problem. Can be a bit tricky to get on at first. Looking for a medium-warmth blanket you can use outside? This option from Derby Originals is a bit more expensive than the others we’ve looked at so far. It’s essentially a winter blanket, but doesn’t quite have the same warmth as the 400g AJ Tack option we looked at earlier. Therefore, it’s perfect for easy keepers during those harsh winter months, or slightly more frail horses when the weather isn’t quite so cold. There are warmer blankets out there, but Derby Originals’ option is perfect if you’re afraid of your horse overheating. You get a nylon outer shell with this blanket, which is what you want. However, it only has a 600 denier rating, not the full 1200D. It does come with ripstop though, meaning that the fabric is woven so as to be as tear-resistant as possible. On the whole, the durability is good, not great, when compared to the other options on the market. This blanket’s fit is second-to-none – the leg straps make it possible to get it as tight or as loose as you need it. Derby have included a specialized moisture-wicking lining, allowing your horse to keep that little bit cooler if they begin running/playing, or if the sun comes out for a few hours. Balanced – 300g of fill, but comes with moisture-wicking lining. Easy to get the fit how you want it. Comes with ripstop – fairly tough for a 600 denier blanket. For those in the south or on the west coast, your outdoor horse might just need a little bit of extra warmth in winter, even if their coat is clipped. If you’re afraid of your horse becoming too hot, but still want something waterproof, it’s worth checking out turnout blankets with just 100 grams or so of fill. This product from Shires is perfect for those looking for just a little bit of added warmth. Its main selling point is actually its breathability. The Airdry comes with a mesh inner lining, which serves to provide extra ventilation for your horse’s skin. As a result, sweating is minimized, even if your horse begins rolling around or playing with their paddock buddies. You still get a tail flap though for additional protection against wind and rain. One important effect of this design is it obviously makes the blanket a little thinner than most other products out there. Because of this, it can wear down a bit quicker than you might expect. However, the outer shell is very rip-resistant, which is great. Considering what you get, the price isn’t cheap, nor is it too expensive. Overall, as a mild winter (or even Spring/Fall) blanket, the Airdry is an excellent choice. Very breathable – great for playful, active horses in particular. Thin – padding can wear down over time. This is another super-warm blanket, which is especially resistant to snow, wind, and rain. However, Tough 1 have taken a slightly different approach to providing added warmth. As opposed to simply packing their blanket with 300-400 grams of fill, the company have only used 250g of padding. To add extra protection, they’ve included a neck cover, which cannot be removed. As a result, this blanket provides well-rounded protection against the elements, without feeling too heavy. In colder environments, this neck protector comes in quite handy – often a horse’s neck is the area with some of the shortest fur. Tough 1 have also designed this blanket to be reasonably breathable. However, it’s still quite warm – we’d recommend only using it in winter, depending on how your horse handles the cold. It’s also a bit expensive, but there’s good reason for this blanket to cost a bit more than average: it’s incredibly well-designed, and also very durable. Another useful feature of this particular blanket is the inner lining. On the top there’s a fleece wither protector, but the actual material which touches the skin is designed to avoid picking up fur, dirt, and straw, making the blanket a lot easier to clean. Neck cover results in excellent warmth. Now we’ll discuss some key things to consider when picking a blanket to keep your horse warm and dry. The climate and the shelter available to your horse. If you have permanent stables and reasonably mild winters, a blanket may not always be necessary. But if your horse lives outdoors, they will likely need something to help keep them warm in winter and fall. The horse’s coat. 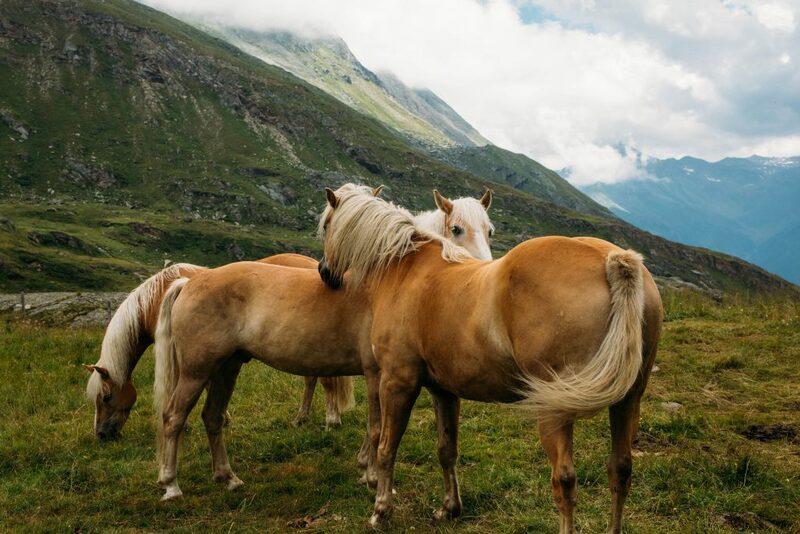 Horses have evolved to withstand quite harsh weather conditions – the species is thought to have originated from North America, before spreading to the European continent. However, not all horses develop a thick winter coat as the summer ends. Also, if you clip your horse’s fur, it won’t be able to regulate its body temperature as easily. Your horse’s age. Older, more frail horses are more likely to need help keeping warm than younger, fitter animals. Your horse’s fat cover. Is your animal an easy keeper (meaning they can live on relatively little food) or a hard keeper (meaning they burn a lot of calories to merely stay warm)? Hard keepers may need a little extra help to maintain their body temperature. There’s no one-size-fits-all guide to blanketing your horse. You can always go for a slightly thinner option, or just use a blanket when it gets particularly cold – horses don’t tend to deal with sudden weather changes very well. To tell if a horse is too cold, check for shivering, or unusually high levels of activity – horses may run around to generate heat. Also feel his or her ears – they can be a good indicator of how cold your horse is. Conversely, check for sweating under the blanket to tell if your horse is too hot. A horse blanket’s weight or “fill” defines how much warmth it provides. Manufacturers normally use somewhere between 100-400 grams of fill. Anything lighter is typically called a “sheet” as opposed to a blanket. 100-200 gram blankets are the lighter variety. They provide a moderate amount of warmth, and work great for horses who live in stables in cold climates, or outdoors in regions with reasonably mild winters. On the other hand, 200-400 gram blankets provide a great deal of warmth. 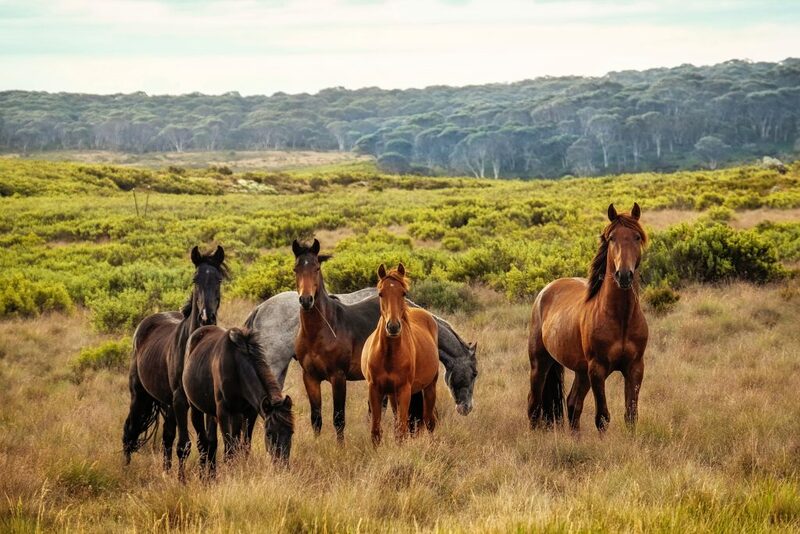 They’re the best option for outdoor horses during the harsh winter months. As we just discussed, you should choose a specific fill weight based on your horse’s body type, age, and how thick their coat currently is. What makes a durable horse blanket? The most durable horse blankets out there will be made of a thick “ripstop” nylon or polyester material. 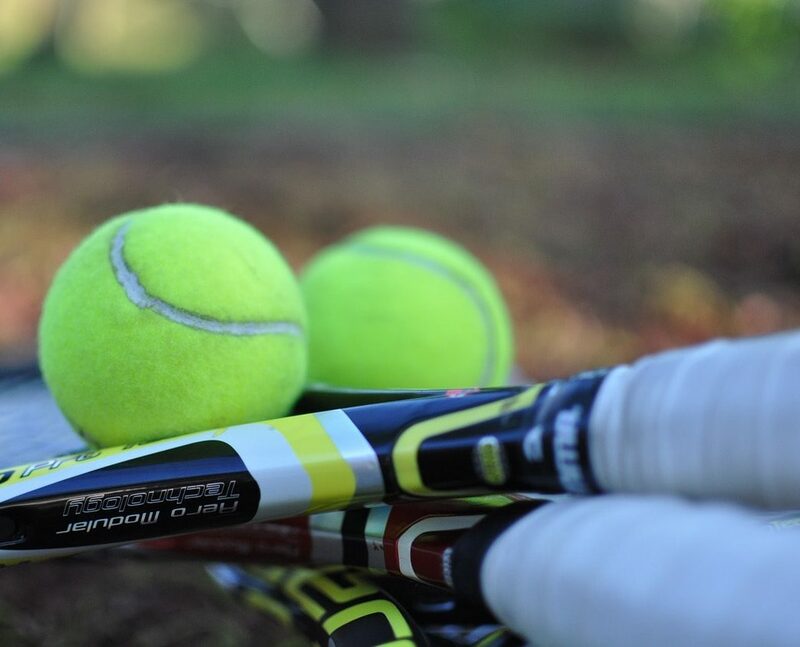 In general, nylon is slightly more durable, as it’s less prone to tearing. Apart from the wind and rain, you’ll also want your blanket to be able to withstand your horse chewing on the material. If they’ve never worn a blanket before, it might take your horse a little while to get used to the experience. Look for options which are especially-advertised as chew resistant if you think your horse would be likely to nibble on their blanket. Most horse blankets come with a “denier” rating, for example “600D”. This simply refers to the thickness of the actual fabric used – higher means better durability. There is also a special type of nylon called “ripstop”. Basically, this means that the fabric is woven in such a way as to minimize the chances of it tearing. The other thing to consider is the blanket ripping on exposed edges on fences or in your barn, especially if your horse likes to scratch itself on these surfaces. Apart from getting an especially tough blanket, you should also look out for an extended warranty if you’re worried about these sorts of rips or tears. Cheap vs expensive horse blankets – what’s the difference? Most horse blankets cost around $60-$80 – the more fill, the more expensive they’ll be. You’ll also pay a premium for tougher blankets, and better horse comfort (which we’ll discuss below). Cheaper blankets on the other hand are normally inexpensive because the manufacturer has used poor-quality materials. Typically, they will rip easily, feel flimsy, and the fill may wear down over time, forcing you to have to buy a new blanket fairly quickly. Horse blankets just aren’t worth skimping on. Your companion will thank you for spending a few extra bucks on a more comfortable option. It’s possible to get a really good-quality blanket without breaking the bank – you don’t have to spend too much if you research what you’re buying. Apart from warmth, there are a few other things to consider when assessing how comfortable a blanket will actually be for your horse. Remember, he or she will have the blanket on for extended periods of time – for your horse’s sake, it’s important to get something that feels nice to wear. Fleece material on the inside (especially the withers) to provide extra softness. The right size – ideally the fit should be highly-adjustable. Too tight and the blanket will feel restrictive, too loose and it will shift around as the horse moves, which becomes extremely annoying. We’ve discussed blanket sizing below. Shoulder gussets. This basically means that the shoulder holes are especially wide, meaning they don’t restrict your horse’s freedom of movement. Breathable material. Ideally, you want your blanket (especially if it’s a cooler variety) to allow your horse’s skin to breathe if they do begin sweating slightly – mesh material can help achieve this. For example, if they begin running around with the blanket on. It’s important to find a balance though – warmth is still your number one priority. 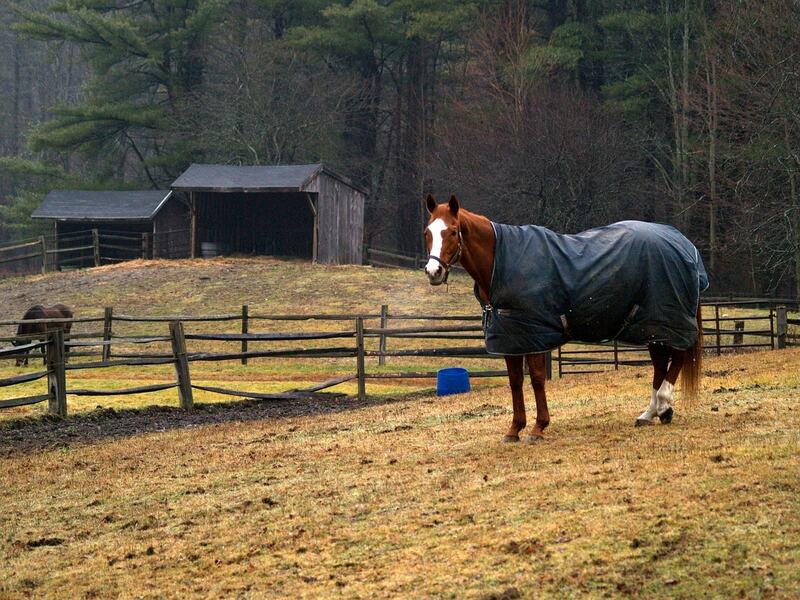 A horse wearing a turnout blanket outside. Turnout blankets are probably what you’re looking for. They’re designed to be used outdoors, and protect your horse from cold weather. For this reason, they’re made to be waterproof, and stretch from the horse’s neck, along the withers, to the beginning of their tail. On the other hand, stable blankets are meant for indoor use only, and are not waterproof. They’re just designed to provide a little extra warmth for horses who live indoors. Horse blankets come in sizes measured in inches. To find your horse’s measurement, use a cloth measuring tape. You basically want to wrap it around half of your horse, roughly parallel to the ground, at about chest height. Begin from the middle of the chest, and end on the rump just before the tail begins. Remember, blankets may run large or small. Take a look at plenty of reviews to determine if you need to go up or down a size. It’s very important that you are able to achieve a snug fit that isn’t too tight. As we discussed above, an ill-fitting blanket can be really uncomfortable for your horse. 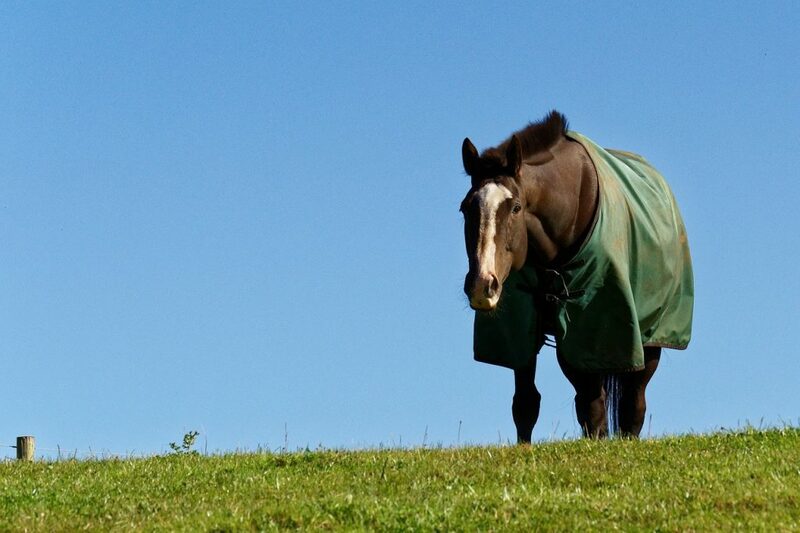 Blankets for your horses are a big investment – particularly if you’ve got three or more animals in your pasture! To keep your blankets looking their best, you can do a simple wash. First, brush or shake off any dirt or hairs left on the blanket. Then, get a large microfiber cloth or towel and some warm soapy water, and wipe down the inner and outer lining. At this point you can hose down the blanket and leave it to hang somewhere to dry. As the days begin to get warmer and your horse no longer needs to use a blanket, it’s a good idea to give your gear a much more thorough wash. There are actually professional services out there to help get the job done – if you’ve got a lot of blankets, these companies can make your life a whole lot easier. However, if you’d like to wash them yourself, you can use your own washer, but it’s worth doing a pre-wash using the method we outlined above beforehand. Since different blankets are made of different materials, it’s a good idea to use the manufacturer’s instructions to wash your blanket. Consider ringing their support line and asking for help if necessary. Typically, they’ll instruct you to use a cold, gentle wash.
Hopefully you found a blanket you and your horse will love. If you’re still not sure what to buy, drop us a comment below and we’ll get right back to you.